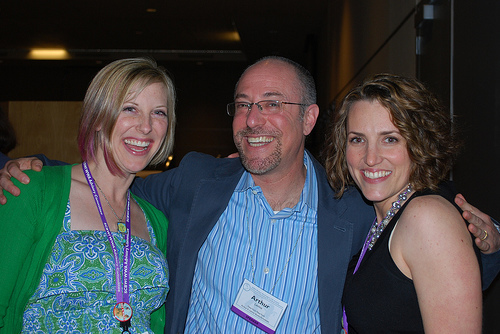 Here's Arthur with a couple of my friends, Sara Easterly and Jolie Stekly (SCBWI Members of the Year in 2010! )A little over four years ago, I met Arthur Levine at a regional SCBWI conference. Correction: I met Scholastic Vice President and Publisher Arthur Levine-slash-editor of the Harry Potter series. I was beyond nervous to meet the man with the fancy title and epic publishing credentials. Then, when he sat down at a table next to me just before the conference started, it felt like someone had put my face under a broiler. It took me all day to work up my courage to speak to him (I had to wait for the redness to recede). In the years since, I've seen Arthur speak at several national conferences and a regional retreat, and I've had the good fortune to work with him on my first two children's books, a young adult novel called DEVINE INTERVENTION and a picture book called THE DINOSAUR TOOTH FAIRY (Israel Sanchez is the illustrator). While he's every bit as inspirational an editor as his title and credits indicate, I've also learned that he's just a regular guy who likes tennis and bacon. He's a husband and a dad. And, like many of us, he's a writer as well (his picture book MONDAY IS ONE DAY is just the thing for kids of parents who work outside the house). In case you're still feeling intimidated, here's more reassurance, from an interview I conducted with Arthur inside his book-lined office at Scholastic. A lot of people are intimidated by you, Arthur. You've edited so many wonderful, award-winning books—and your name is right there on the spine. Should writers be afraid to make eye contact with you at conferences? Or are you actually approachable? The first thing people should imagine is that I am attempting to put on one of your bracelets and being unable to. In other words, I’m just a person with hairy wrists. There’s no need to be intimidated. There’s nothing to be intimidated about. But don’t feel like you need to pitch me. The moment when we’re saying hello is just a moment to say hello to another person. Your “impressing” me in that moment is not what’s going to make me publish you. It’s your great writing that’s going to make me publish you, and that’s gonna come later. What I love about a conference is just the opportunity to have real, pleasant, face-to-face, casual interactions with people. It isn’t a place where somebody has to use that moment to pitch me something. I don’t actually like to be pitched at all. Ever. That is the truth! Pitching is the genesis of awkward and difficult interactions. People get nervous because they have this idea that they’re in the elevator with me and they have to take that five seconds to capture my attention. It’s SO not true. Just say hello, introduce yourswelf, nice to meet you, I enjoyed your talk. Thanks for publishing Book X if you have a book I’ve published that you loved. The bar is low. Just be pleasant! Treat me the way your parents said you were supposed to treat a stranger. Just be polite and nice. Remember that I am often quite overwhelmed at these conferences, as are the conference participants. We’re all working really hard and having a good time, but I’m not there to stand apart. I’m there to make connections on a person level. You and your team have published a wide range of titles, from sweet and funny picture books to middle grade comedies to contemporary YA. Is there one thing that all Arthur A. Levine books have in common? I like to say that it’s the truth that connects all these things. The truth about anything. If somebody is telling the truth about something, it will come through in the writing. Sometimes the truth makes you laugh. And sometimes it hurts. And sometimes it’s just a big relief, right? It can take many, many forms. For instance, THE DINOSAUR TOOTH FAIRY tells something true about friendship and rivalry. It’s a funny book about teeth and rivalry, and it does tell something true. MILLICENT MIN, GIRL GENIUS tells the truth about intelligence in its many forms. That’s what links all these things. I think what makes something literary is the effectiveness of the writer at making me understand that truth. That’s what makes a book literary. There also is a certain high bar of authorial skill and illustrative skill. You've changed your submissions policy. Now, you're asking for them electronically. What prompted the change? How does being a writer make you a better editor? I think writing and editing are two sides of a conversation. For a conversation to be really good, it’s helpful to be able to talk and to listen. I do always think that in the back of my mind, whenever I’m saying something or about to say something to a writer, how would this make me feel. I would guess that all good editors do that. For me, (writing) has this direct application. I have to be articulate about my reaction. It’s the only way I’m going to be able to let you know what that is. They’re not fictional skills. They’re just tools of articulation and diction, metaphorical expression. I am the stand-in for the reader. I always say that. But I’m the reader you get to respond to. Can you tell us about a few upcoming books conference attendees should look for? Who are some more of your conference success stories? I saw Dan Santat's portfolio in the portfolio display and knew right away that he was somebody with tremendous talent that I wanted to publish. This has gotta be 10 years later—we’re still working together. Lisa Yee is somebody I met through SCBWI. She heard me and then contacted me afterward. She did not pitch me. Mike Jung: I encountered his writing on Facebook. Mike was leaving all these incredibly funny comments on Lisa’s Facebook page, so that’s how I saw his writing, which is a good thing for people to remember. When you’re writing publicly, people see things. It has to be the writing first, of course. It really is their writing that will get them noticed, and it’s not hard to get good writing noticed by me. If it’s good, it’s going to stand out so much from everything else. Rest assured, somebody will bring it to my attention.